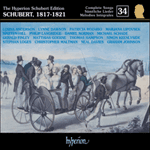 This is another product of Schubert’s first stay at Zelisz in 1818, but this broad and magisterial work is altogether more serious than the Sing-Übungen. The latter had been conceived for the Esterházy daughters, but this song was very probably written for Count Johann Karl Esterházy himself, an amateur bass who would have needed every ounce of whatever ability he had in order to sing it. We must remember that Schubert wrote the following from Zseliz: ‘Not a soul here has any true feeling for Art except (if I am not mistaken) the Countess now and then’. One fears that Esterházy might have been a pompous and vainglorious singer, not nearly as talented as he imagined. Nevertheless, he was the boss, and he must have boasted a low E among his accomplishments for the composer to have made such a feature of it. It makes us wonder whether Der Kampf (a song of a similar vocal range) had also been intended for the count (an audition work, perhaps) some time before the composer went to Hungary for the first time. Der Kampf, however, has a text which is rather too racy for a married man of high birth and morals, a complete contrast to his distant relative Nikolaus Fürst Esterházy who was one of the most notorious libertines of the age. This branch of the Esterházy family seems to have favoured sacred themes in their home music-making (exemplified by Gebet, the Fouqué poem set by Schubert as a quartet during his second visit in 1824). Schubert’s settings of Schreiber are all from 1818, and although his first setting of this poet, the beautiful An den Mond in einer Herbstnacht, dates from April (before he went to Zseliz) it seems too good to be true that he hit on an author by chance whose religious outlook chimed with that of the Esterházys. Schubert was employed as a teacher at the count’s Vienna establishment before he went to Hungary, and he might have borrowed the Schreiber poems (which had been recently published in Germany) from this source. Das Abendrot is not considered in quite the same class as An den Mond in einer Herbstnacht. It is indubitably a fine song but it just misses the highest accolades for the same reason as Der Kampf: it has the feel of a set piece where the desire to cater for, and please, a patron is a little too obvious. The result of this, as John Reed points out, is ‘a lack of any great depth of subjective feeling’. The composer’s professionalism, and his pride in being able to tailor music to the needs of the moment, particularly if this contains an element of ‘dumbing down’, obscures something that would have gone deeper had he been left to his own devices. This reminds us that, for the most part, Schubert was entirely free of toadying considerations for most of his life. It is just as well for us that he never found a long-term employer: his muse needed to float free, answerable only to his inner dictates, for the greatest masterpieces to come into being. Nevertheless, Das Abendrot does not deserve its neglect (which is the result, almost certainly, of its wide vocal range) and it contains wonderful things. We are familiar with the ceremonial tone of the opening – spread E major chords, as if played on the harp of a seer. One is reminded of the majestic opening of the Kosegarten setting Der Abend D221, and the wonderful Ossian setting Die Nacht shows how well the composer identified with the onset of evening as some kind of an ancient and mysterious rite. And it is true that much of Schubert’s night music contains a sense of solemn ritual. The bass voice here means that echoes of Sarastro and Die Zauberflöte are also never far away. The four-bar introduction sets the tone in ideal fashion. The entry of the voice signals an aria which roams generously across the stave (the song is notated in the bass clef) in the manner of an old-fashioned bel canto showpiece. 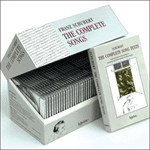 The music is cleverly assembled from the elements of singing exercises – scales and arpeggios – which might have been undertaken with some pride by an amateur. The gently rocking accompaniment nurses the voice along. If the singer of this song did not have an infallible sense of rhythm (and an inclination to wallow in self-indulgent rubato) this is exactly the sort of elastic figuration which could expand and contract in helpful fashion, providing the accommodating accompanist is prepared to indulge a singer’s foibles. Of course the grandiose movement of the bass line is a typically Schubertian achievement, as well as the change of colour at mention of the martyrs and the yearning settings of the word ‘Liebestod’ which, in the spacious and solemn context of a bass aria of this kind, contains more Wagnerian pre-echoes than one might have imagined. The anachronistic appearance of this word reminds us how much Wagner’s music, while aspiring to be the music of the future, owes this sort of scène. Indeed, if one were searching for the names of composers who might have composed the more ordinary passages of Das Abendrot, one would think of such names as Marschner and Meyerbeer. The propensity for the lowest vocal range brings Loewe to mind. There is now a four-bar interlude built from the same cell (two semiquavers followed by two quavers) that has accompanied the opening aria. A very similar figuration in exactly this rhythm, also built on stretches of a seventh, is the basis of the accompaniment to the Mayrhofer fragement Über allen Zauber Liebe. The central section of the song (the second strophe) is in C sharp minor and in Schubert’s Der Wanderer manner. The setting of ‘still und grau’ (a high C sharp descending to G sharp, a twelfth below) has a built-in element of vocal show-off. Once again the accompaniment (a dotted figuration between the hands) is kept to a minimum the better to accommodate the singer’s anticipated rhythmic vagaries, and to keep him strictly in time. But the gliding-swan imagery of the strophe’s third line inspires the composer in a more intense way. At ‘der Schwan auf purpurroten Fluten’ the vocal line descends the stave supported by a downy bed of piano semiquavers, while the glinting dew (‘und jeder Halm im Silbertau’) is depicted by syncopations, semiquaver droplets pricked out between the hands. The repeat of these words inspires music even more wonderful. The vocal line remains dignified and spacious, containing just the right amount of regal poise for the progress of the noble swan. Underneath this music which glides and dips horizontally, the rippling-water effect of the spiralling arpeggios, beginning in the treble register with glinting top notes and traversing two octaves, is as languidly luxurious as Ravel’s accompaniment for Le cygne (Histoires naturelles), a song which describes a very similar nature-picture. In both pieces of music the piano writing, leisurely and intricate at the same time, suggests the symmetrically patterned circles breaking on the water as the stately galleons of beak and feather cleave the surface. There is nothing quite like this in all Schubert, and Das Abendrot deserves attention for these six bars alone. The song’s final section, marked ‘Feurig, doch nicht zu geschwind’, seems composed to an old-fashioned cantata formula, although there is nothing as vulgar (or difficult) as a cabaletta on offer. We realise that the voice for which this song is written is unable to move in dazzling fashion – fast coloratura was obviously not in the Count’s gift. Instead, the poem’s final strophe is variously repeated to make an extended grand hymn framed by pomposo chords and flourishes, and where the harmonies remain more or less within the orbit of I – IV and V, the better to suggest something fundamental – the sunset as a work of nature. The phrase ‘als im Entfliehn’ is followed by a gentle, even wistful bar, a solitary rising phrase prophetic of that extraordinary postlude to Schubert’s definitive sunset song, Freiwilliges Versinken (1820). In both cases the downward direction of the vocal line (here on the word ‘Entfliehn’) is mirrored by an ascending echo, as if all things are balanced in nature – the setting of the sun with the rising of the moon. The last two lines of the strophe, when heard for the fourth and last time, provide the text for an extraordinary twelve-bar coda. Capell finds that the musical interest dwindles at this point, but that is perhaps because he was not a pianist. The wonderful thing with this passage is the sheerly physical sensation of playing it. The bass line switches between tonic and dominant, as if shifting on a giant axis, but this is not so unusual. It is the right-hand writing that is unique in the Schubert songs: an upper pedal framed by a sumptuous bank of ninths and tenths (it is a pity if one has to cheat and play them with the help of the left hand, but the composer probably did) which, combined with the tessitura of the vocal line, seems to create an impression of immense space and grandeur. The depth of the voice and the pulsating light suggested by the piano (particularly in this unusual chord distribution) are irresistibly complementary. The words, as always with this composer, have suggested this analogue for the Creator’s radiance. This ‘Glanz’ is interpreted by Schubert as some kind of starlight, so in these solemnly throbbing chords we hear the prototype of such great songs as Die Sterne and, above all, Nachthelle. Granted this page has to be well sung to make its effect (and the accompaniment, as marvellous as it is, takes a back seat with deliberate tact) but one finds oneself agreeing with Einstein, who finds in this song ‘varying degrees of lyricism, utterly exquisite, yet not superficial’. A strange hybrid then. Some of the most wonderful things about it, the shy details which Schubert provided for himself as patient accompanist, probably went unnoticed by its first singer, and have gone unnoticed since. Hold lächelnd in dem Liebestod. Und jeder Halm im Silbertau! Nie herrlicher, als im Entfliehn! The sky melts into radiance. serenely smiling as they die for their love. and every blade is bathed in silver dew. never more glorious than when you go down! to the source of your radiance.